Gerard Parkes in his best known role as "Doc"
It’s one of those faces you may recognize without knowing the name, an actor who always seemed to be playing some role – starring or supporting – on Canadian television. 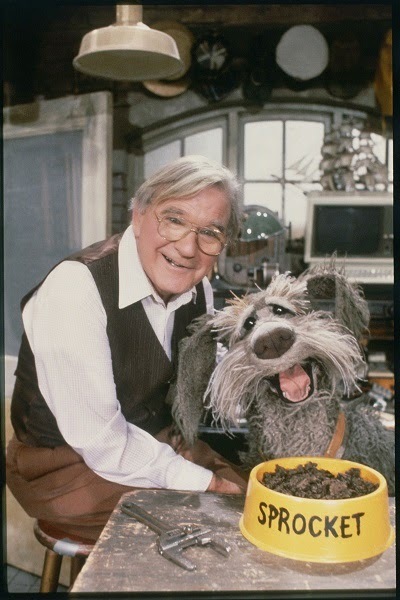 He eventually gained international fame as Doc, the lone human in “Fraggle Rock”, but the career of Gerard Parkes was much richer and more diverse. He passed away recently at the age of 90. It was a show I am sure I would appreciate more as an adult than I did as a child but, for three seasons, the CBC had a popular show called “A Gift to Last”. I remember it best on Sunday nights. It starred Gordon Pinsent as a soldier, and Gerard Parkes played one of his brothers, a shyer quieter sibling. Pinsent was the centre of the show, but the presence of Parkes was unmistakable. “A Gift to Last” is a show the CBC should dig out of the vault some time. It also set Gerard Parkes up for his next role. Gerard Parkes' next recurring role was in another Sunday night drama I started watching. It was called “Home Fires” and he played a doctor named Arthur Lowe, fittingly nicknamed “Doc”. It was another show I am sure I would appreciate more now as an adult, but there are a few things I do remember. It aired from 1980 to 1983, centring on a family in Toronto during the Second World War. One episode in particular I remember saw Doc run for elected office under the banner of this new party called the Co-operative Commonwealth Federation. It was my first exposure to the CCF and, only years later, did I discover they would morph into the modern New Democratic Party. Doc had his hands full, because there was a large presence by the Orange Lodge, and after he refused to co-operate with them, they ran their own candidate. It led to Doc’s defeat. There was also a recurring story line about Lowe's wife's nephew, a boy named Jakob. He was a Jewish refugee from Europe who came to Toronto. Initially, he was unaccustomed to life in Canada. When he was offered an orange at a market, he bit into it like an apple. In later episodes, where he had learned to speak English and became more acclimated to life in Canada, he looked back and laughed at that moment. And, perhaps what I recall most, was that “Home Fires” was the first recurring role for a young Canadian actress named Wendy Crewson, who played Lowe's daughter Terry. She was already a looker then, and would go on to a successful career that continues today. Most notably, she played the American president’s wife in “Air Force One” alongside Harrison Ford. To Canadian viewers, she brought to life the character of Joanne Kilbourn in several TV movies, and plays a doctor on the current CTV hit “Saving Hope”. Gerard Parkes, as doc, was the stabilizing force, the patriarch of the family and the show. After that ended, Parkes found another role as a “Doc”, this time as the only human character on “Fraggle Rock”. The entire community was located behind the wall of Doc’s shop, but he was oblivious to it. Only his dog knew about the Fraggles, the Doozers, and everyone else in that mythical land. It’s funny. If I was too young for “A Gift to Last” and “Home Fires”, by the time “Fraggle Rock” hit its stride, I was too old. I moved on to other things, most notably more adult TV shows, video games, computers, and girls. Amid all that, Gerard Parkes did guest spots in a who's who of Canadian shows: "Night Heat", "The Littlest Hobo", "King of Kensington", and "Seeing Things". He also found his way to U.S. network TV in shows such as "Cagney and Lacey", "The Twilight Zone", and "War of the Worlds". Perhaps, more memorable for me were spots in films such as "Glory Enough for All", which documented the discovery of insulin by Canadians; and "The Suicide Murders" which was the first Benny Cooperman novel to make it to TV. Cooperman is a uniquely Canadian private eye in Ontario, created by Howard Engel, and played by Saul Rubinek. The television landscape, especially in Canada, is a much different place than it was in the 1980s. If an actor wanted to be on Canadian TV they essentially had two choices: CBC and CTV. The public broadcaster had a lot more money to make a lot more Canadian content, but the choices were still limited. In the 1980s, with the advent of the low Canadian dollar and other factors, American production came north, and there were a lot more TV opportunities. When the number of pay and specialty channels began to proliferate, there were even more opportunities. During much of his early career, Gerard Parkes did not have those opportunities. In the days of peasant vision in the 1980s, and the three channel universe, actors such as Gerard Parkes made the most of it. That't why we may recognize the face, but not the name. He made the most of those opportunities. Finally, when there were more channels and shows, he found "Fraggle Rock", which gave him at least a bit of the notoriety he deserved.